An extraordinary, exquisitely written memoir (of sorts) that looks at race--in a fearless, penetrating, honest, true way--in twelve telltale, connected, deeply personal essays that explore, up-close, the complexities and paradoxes, the haunting memories and ambushing realities of growing up black in the South with a family name inherited from a white man, of getting a PhD from Yale, of marrying a white man from the North, of adopting two babies from Ethiopia, of teaching at a white college and living in America's New England today. From the acclaimed editor of Remember Me to Harlem: The Letters of Langston Hughes and Carl Van Vechten ("A major contribution," Henry Louis Gates; "Magnificent," Washington Post). "I am black--and brown, too," writes Emily Bernard. "Brown is the body I was born into. Black is the body of the stories I tell." And the storytelling, and the mystery of Bernard's storytelling, of getting to the truth, begins with a stabbing in a New England college town. Bernard writes how, when she was a graduate student at Yale, she walked into a coffee shop and, along with six other people, was randomly attacked by a stranger with a knife ("I remember making the decision not to let the oddness of this stranger bother me"). "I was not stabbed because I was black," she writes (the attacker was white), "but I have always viewed the violence I survived as a metaphor for the violent encounter that has generally characterized American race relations. There was no connection between us, yet we were suddenly and irreparably bound by a knife, an attachment that cost us both: him, his freedom; me, my wholeness." Bernard explores how that bizarre act of violence set her free and unleashed the storyteller in her ("The equation of writing and regeneration is fundamental to black American experience"). She writes in Black Is the Body how each of the essays goes beyond a narrative of black innocence and white guilt, how each is anchored in a mystery, and how each sets out to discover a new way of telling the truth as the author has lived it. "Blackness is an art, not a science. It is a paradox: intangible and visceral; a situation and a story. It is the thread that connects these essays, but its significance as an experience emerges randomly, unpredictably . . . Race is the story of my life, and therefore black is the body of this book." And what most interests Bernard is looking at "blackness at its borders, where it meets whiteness in fear and hope, in anguish and love." EMILY BERNARD was born and grew up in Nashville, Tennessee, and received her PhD in American studies from Yale University. She has been the recipient of grants from the Ford Foundation, the NEH, and a W. E. B. Du Bois Resident Fellowship at Harvard University. Her essays have been published in journals and anthologies, among them The American Scholar, Best American Essays, and Best African American Essays. She is the Julian Lindsay Green and Gold Professor of English at the University of Vermont. "Of the 12 essays here, there's not one that even comes close to being forgettable. Bernard's language is fresh, poetically compact, and often witty ... Bernard proves herself to be a revelatory storyteller of race in America who can hold her own with some of those great writers she teaches." "Black Is the Body brings lucidity, honesty, and insight to the topics of race and interracial relationships ... quietly compelling ... [Bernard's] stories get under your skin." "Bernard's lyrical book details traumas and pain from decades past to interrogate the nuances of her own life: growing up black in the South, marrying a white man from the North, and surviving a violent attack which unleashed the storyteller in her." 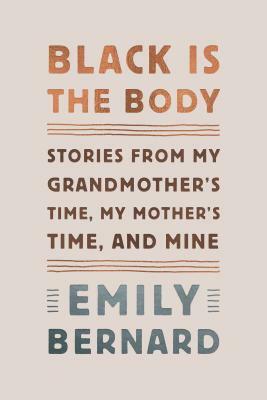 "Echoes of Joan Didion--terse yet beautiful writing, a bracing honesty--in the graceful new essay collection by Emily Bernard ... Black Is the Body marks the debut of an essayist in command of her gifts, a book that belongs beside the best of contemporary autobiography." "Conceived while the author was hospitalized after being stabbed by a white man, these 13 formidable, destined-to-be-studied essays mark the emergence of an extraordinary voice on race in America." "Like the absurdly devastating crime that opens this riveting collection, Bernard's essays are impossible to turn away from. Linked by the author's powerful voice and by her experiences of the world--of survival, of falling in love, of interracial marriage and friendship, and of motherhood--each account tells the agonizing story of race in America with realism, nuance, and profound hope. A supremely honest and utterly gripping book." "Bernard's honesty and vulnerability reveal a strong voice with no sugarcoating, sharing her struggle, ambivalence, hopes, and fears as an individual within a web of relationships, black and white. Highly recommended." "Lucid ... deeply felt, unflinchingly honest, and openly questioning ... [Bernard] illuminates a legacy of storytelling ... and elaborates on the relationship between blacks and whites. A rare book of healing." "Contemplative and compassionate ... Bernard's voice is personable yet incisive in exploring the lived reality of race ... [Her] wisdom and compassion radiate throughout this collection."